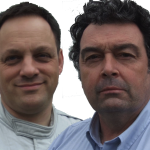 Tim Gray looks ahead to the 2018 Formula One World Championship season with the help of Nick Daman and Sam Collins. John Hindhaugh and Nick Daman look back over the 2018 ..
John Hindhaugh is joined in Bathurst by Richard Craills. Nick ..
Nick Daman previews the new Moto GP season, which starts ..
John Hindhaugh hosts the show live from Sebring, with exclusive ..
John Hindhaugh and Nick Daman preview the 2017 FIA Formula ..